We are hours away from HTC "see what's next" event and the company, playing coy, posted an official teaser on its Facebook page Tuesday afternoon to whet our whistles. 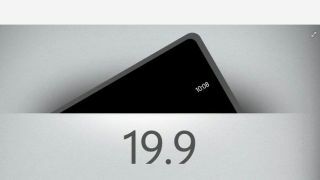 Just the corner of a phone is visible, though what we can see what appears to be the clock of a Windows Phone, giving enough of a hint as to what we can expect Wednesday morning. The picture is also accompanied by the caption: "When beautiful hardware meets stunning software." Could HTC not only be playing up its new design but also what we'll find inside? A leaked image purportedly of the HTC Accord (also known as the HTC 8X), a Windows Phone 8 handset, also emerged Tuesday. Whether this device, if authentic, and the Facebook teaser are one in the same, we won't know until Wednesday, Sept. 19. TechRadar will be at the New York City event live, bringing you all the latest from HTC as it happens.